We are expertised in manufacturing & supplying a comprehensive range of tool holders which is made of premium quality cast iron and tungsten. With highly efficient clip flow these are offered in various lengths & other dimensional specifications. These are enabled with unequal helix and unequal flute spacing; these tool holders provide optimum performance and maximum functionality. Face mill holders consist of an arbor and a pair of bolt-on drive keys to securely hold cutter bodies. Face mill holders also known as Shell mill holders. We offer nickel-plated Face mill holders which are hardened and durable. 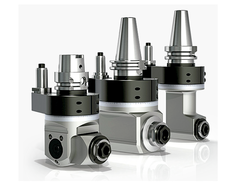 You can avail a wide range of Face mill holders from us. We have Face mills with bore diameters and both metric and inch sizes are available. - Birla Precision offers the largest variety and highest quality End Mill Holders on BT/DV/CAT/HSK shanks. - Short/Long gauge lengths in Metric & Inch version available. - Size range - 6 - 50 mm in metric & 1/8 to 2 in inch version. We are wholesale End Mill Holders Weldon type. 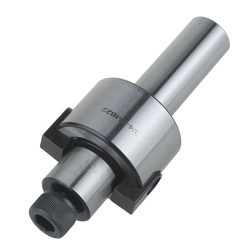 - End Mill Holder used for holding straight shank tools. - Available in BT, SK, HSK, ISO tapers. We offer the largest variety and highest quality end mill holders on BT/DV/CAT/HSK shanks. short/long gauge lengths in metric & inch version available. Size range 6-50mm in metric & 1/8 to 2" in inch version. The bores are controlled in H6 class & R/O is within 0.005mm/0.0002" w.r.t. taper.